Love the nostalgic aromas, soothing breeze, and serene sounds of nature? Since you can't bring the outdoors in, go pass the boundaries of your imagination and the literal walls of your home and start living outside on your new custom deck or screened porch! Entertaining and relaxing outside on the deck is one of the favorite past times of homeowners in Ashburn, Aldie, Leesburg, VA and surrounding areas. 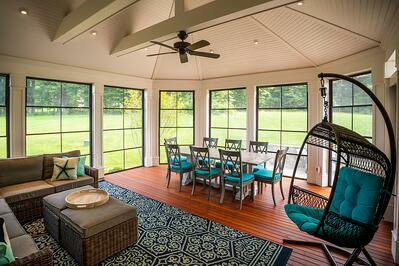 By adding custom decks and screened porches, we've helped local homeowners add even more living area to their homes. 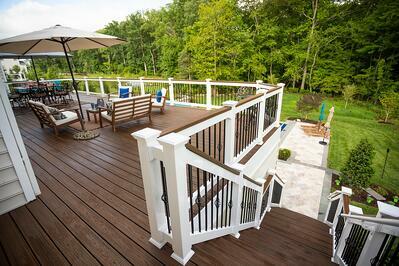 Our deck design team has vast experience with low-maintenance decking and railing materials and would love to design and create a one-of-a-kind outdoor living area to suit your individual taste and needs. Whether it's a simple landing and stairs to transition to your patio or if it's a complex project including a roof, lighting, screens, windows, fans, and more, we'd love to talk to you. Check out some of the images of outdoor kitchens we designed and built. When you’re ready, don’t hesitate to contact us for a consultation with one of our landscape design team.